Just a little post today to celebrate the Auckland libraries that we know and love, and to share some thoughts from library users. Wendy visited all 55 Auckland libraries in 2011 and blogged about it, and she provided a link to a paper about the development of Tupu Youth Library . In one section, I came across a pamphlet with recommendations for biographies, autobiographies and memoirs. In another, there was a pamphlet for romance novels. These kinds of reviews and suggestions are a great tool for library users. And if you find the book you want is already out, ask a librarian and they’ll be able to help you request the book – with the resources of 55 libraries at the click of a button, I’m sure it doesn’t take long for the book to reach your local branch. 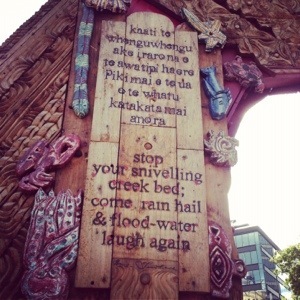 And here’s the image that I never managed to get while I was over there – Claire’s photo of Robert Sullivan’s poem Kawe Reo used to great effect at Central. In our survey we looked at evaluation of readers advisory programs. Do we capture what our community thinks and how they are served? It would be good business sense to get this right. How do you engage with your community to ensure your RA programs are making a positive impact? How do you measure impact? One thing would be to capture the online posts about your library from twitter, blogs, FB, and use them in reports. There are people in your community discussing the library online – that’s a good thing. 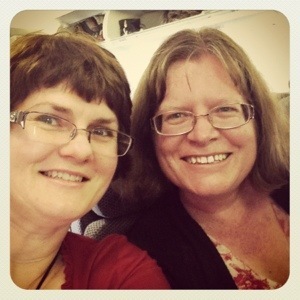 A Queensland blogger is touring libraries – if she has visited yours have you included her posts in your library’s reports? That’s something I can start doing (our library gets some good comments on FB and twitter). 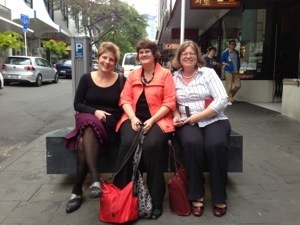 We took a lot of photos in Auckland, mostly inside libraries and certainly of many librarians. Check out the many readers advisory techniques used in Auckland’s libraries on our flickr collection. 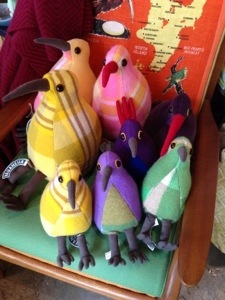 And if you’re visiting Auckland, please drop in to the libraries and say hello from us. We miss those guys! As well as meeting great librarians from the public libraries we also met the very inspirational Fiona Mackie, President of SLANZA (great article about her and Word Up in Collected #9, pages 16-17) and Catherine Frew from the Corporate Library. 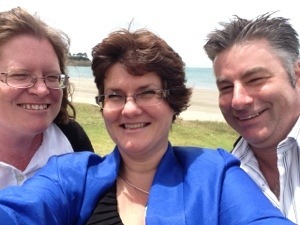 We caught up with the marvellous Tosca Waera (Social Media Coordinator, the personality behind @Auckland_Libs), Sally Pewhairangi from Finding Heroes (who inspires us with her big ideas) and Paul Brown – our amazing tour guide and readers advisory expert. Here’s a link to a LIANZA 2012 paper by Richard Misilei, the awesome manager of Tupu Youth Library – South Auckland Libraries: Connecting with Southside Youth. A library service to be proud of. If you’ve been there, shout about it! 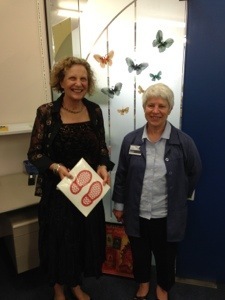 We visited Central City, Botany, Tupu, Onehunga, Massey, Titirangi, Henderson, Takapuna and East Coast Bays libraries. I’ve been writing a readers’ engagement plan at work to support our venture into becoming the go-to people for all things to do about reading. I am interested to hear if other library services have developed strategic plans in this area. Let us know in the survey! Early days yet with the survey and our research, but to some extent it looks like readers advisory is just another thing library staff are asked to do. It’s not necessarily built into strategic plans or job descriptions or professional development. Staff need these foundations to become great at connecting people with books (stories and information). Ellen Forsyth asked on twitter today ‘Is it reasonable if I suggest that library workers should spend 10 – 15 minutes a day on their own professional development?’ She is currently working in Timor Leste and the question was for that region, but this is a concept that has been tossed around in this country. In this information profession we help people search for information, but in many cases spending time searching on one’s own at work is viewed as timewasting. I believe we need to be in the spaces our community is in. They watch The First Tuesday Bookclub, read the reviews in The Age, and listen to stories on radio. If our staff do not take time to find out about these resources, then we are not providing the point of difference over Amazon or the local chain bookstore. Training and literary knowledge is required to gather together similarly themed books for Auckland’s popular Take Five program. This is a great program for fast issues for borrowers when you have RFID, and good training for staff to gather the right books together. You don’t gather five books of the same format, but of similarly themed content – for example with 1984 you could have The Hunger Games, a George Orwell biography or Haruki Murakami’s 1Q84 , a political book on totalitarianism and the 1984 DVD. Readers have the chance to extend their reading, to discover new reading experiences. You could extend those recommendations with bitly or QR code links to your eResources, and links to download the audiobook, and music suggestions like The Dead Kennedys and Rage Against the Machine who have referenced 1984. For expert advice I recommend you head off to Information Online in February and check out Paul Brown’s session on contextual readers advisory. It’s amazing stuff, and something that really requires strong foundations in our staff to develop and deliver this service. It is hard to believe today is our last day of visiting Auckland City Libraries! 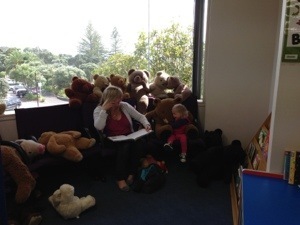 We headed north and our first stop was Takapuna community library on the North Shore. 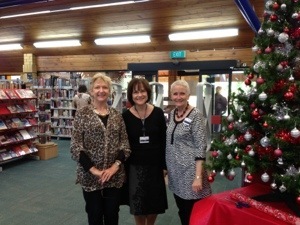 We met Helen and Jacquie, who showed us around, held a morning tea for us and discussed their library’s great initiatives for readers and the community. The neighbourhood project is an outreach project to the local community by the library with the intention of getting to know the local businesses in the area, and sharing relevant library information with them. This also includes a readers advisory service as they answer questions. 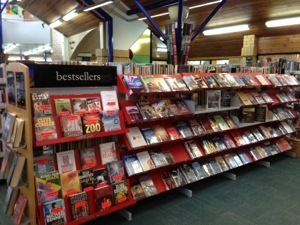 They are also piloting a personalised service for older readers that has been received well. Of the many conversations we have had over the last week about librarianship, today we were reminded about the importance of seeking out opportunities when they arise. 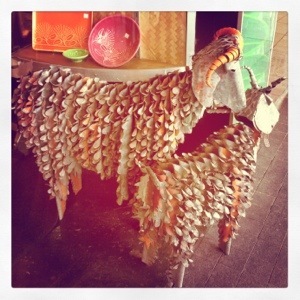 Being a yes person instead of saying no, and never knowing what possibilities we are turning down. 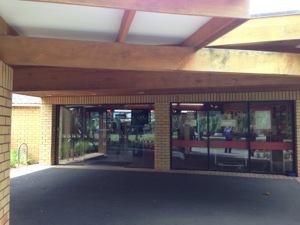 Takapuna library values the literary history of the area and staff work closely with writers and publishers in the area, leading to links with local writers’ centres and author visits including Michael Palin. East Coast Bays Library was the last library on our week long tour. We met Anne, Joy and Sarah who feel very strongly that the reading experience must engage customers and promote the collection. We heard about their twice monthly book chats where people bring two or three books in and talk about them with the group. While facilitated by staff, the group operates a peer to peer readers advisory within the group. The books recommended could easily be added online and shared with the wider community via library website, library blog and Pinterest! The shelving and display of newly returned items, and new books has created a browsing zone for customers, who then borrow heavily from this area, thus reducing returns shelving by up to 47%. 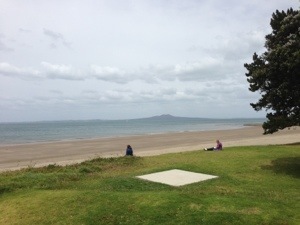 We had a late lunch in the area and braved the crazy winds to walk along the waterfront and view Rangitoto Island from a northerly perspective. We are looking forward to spending some time reflecting on the many ideas we have heard and practices we have observed from our time in Auckland. Thanks to all who gave up time to speak with us, we are so very grateful. As part of winning the QPLA scholarship, Alison and I have the privilege of visiting Auckland Library Service for a week long study visit. We get to spend time with a variety of librarians and staff from many different libraries that make up the service, and talk all things readers advisory/development. I will try and post a couple of photos each night from our day. 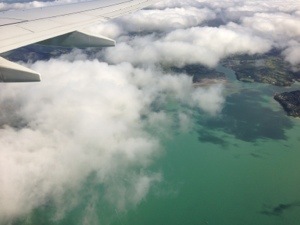 After giving up on finding any free wifi that actually connected us to the Internet, we meandered around Auckland CBD, looking like tourists and taking in the sights.